Are you wondering which service provider to trust for installing your commercial carpets? The truth is, you’ll find numerous names in the industry that claim to have the experience and expertise to perfectly install new carpets in your office. However, that doesn’t mean you can just choose any business to do the job for you. Installing commercial carpets is not something you do on a regular basis. 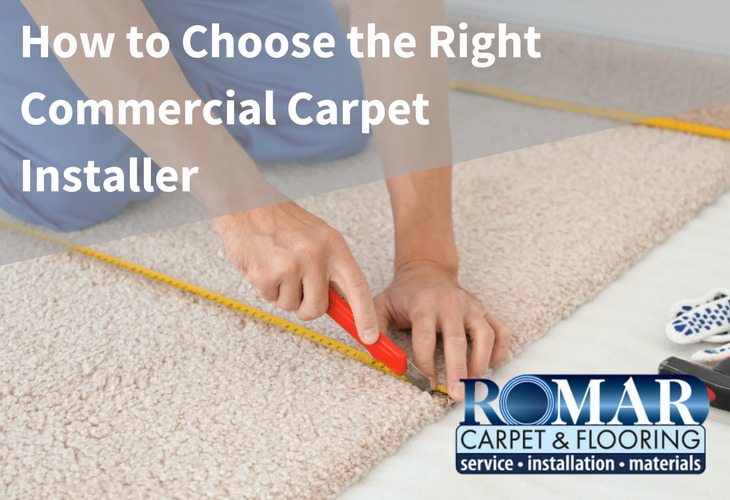 It’s better to jot down all the qualities you need in a commercial carpet installer and conduct a thorough market research to find the right service provider. We are aware of the factors to consider when searching for the right commercial carpet installer. Let’s look at the aspects you should focus on before finalizing your carpet installer. Having this information will allow you to narrow down your search and shortlist only those that meet your requirements. It’s always preferable to take quotes from several businesses, as most of them have different pricing plan. According to your set budget, shortlist the businesses that come under your affordability. That doesn’t mean you should pick the cheapest service, as they mostly lack quality and skilled workers to perform up to the mark. Usually, business owners install commercial carpets that remain in pristine condition for years to come. If you have the same mindset, you should evaluate the different designs and materials the installer has to offer. Carpets are made out of polypropylene, nylon, wool, polyester, acrylic, and other cotton materials. Choose the material that can stand the foot traffic in your office and is comfortable. You’ll find carpets in various colors, shapes, and textures. Pick the design and color which looks best with your furniture and wall paint. If your furniture and wall paint is light colored, you should go for carpets with warm colors to create a contrasting effect and make the floor look attractive. If you have shortlisted a few commercial carpet installers by now, try to find out about each business’s reputation in the market. Check out their website or social media page, and have a look at recent customer reviews and comments. You can also chat with people who have reviewed the business for further questions. That’ll give you a better idea of how good the service providers are at what they do. One common problem with many service providers is that they take longer than they are supposed to finish the job. While the installation process is going on, you won’t be able to use the floor, which can reduce your staff’s overall productivity, leading to losses. Therefore, you should ascertain whether the prospective service provider is capable of completing commercial carpeting projects promptly. Before signing an agreement, always mention the timeframe clause in the contract. Usually, it takes one day per room, but it all depends on the covered area of each space in your office. While carpet installers with a large clientele reflect on the quality of their services, it is recommended that you avoid choosing the company that already has a lot of clients lined up for orders. Businesses that have too many clients usually fail to provide you with the quality and attention required for completing the job up to your satisfaction. They may have the best workers, but if these workers are always in a hurry to reach the next client, there will be a high chance of making errors. Commercial carpets are an attractive and decent flooring option for your office. Due to the rise in competition among carpet installers, it has become quite difficult to decide which one offers the best services. With the help of this checklist, you can get a better picture and will be able to evaluate different carpet installers to pick the right one. These tips worked for me for installing carpet flooring in my office; surely, they’ll benefit you as well. Did you find this tutorial useful? Want to add something to the list? Let me know in the comments.